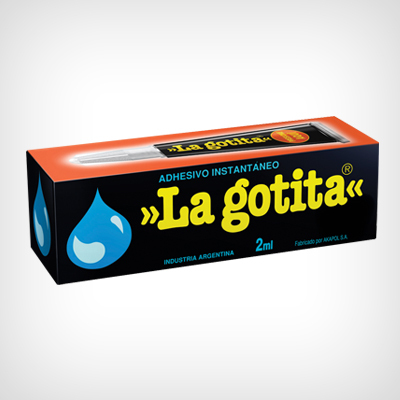 LA GOTITA® is an instant adhesive, easy to use, for small home repairs. It bonds almost any material in few seconds (metal, rubber, porcelain, ceramic, plastic, wood, etc.). 2 ml cases and 10 ml bottles. 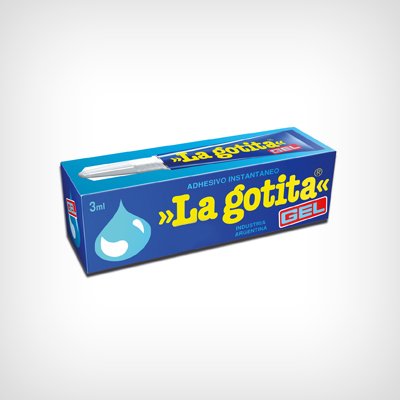 LA GOTITA®GEL is an instant adhesive for home repairs, easy to use and correctible. It bonds in few seconds almost any kind of material (metal, rubber, leather, porcelain, etc) on porous or nonporous surfaces. Due its GEL consistency, it can be applied in an upright position or on vertical surfaces without dripping.